At first light the Turks begin shelling the 54th divisional artillery on the Mansura Ridge, and they also re-occupy the eastern slopes of Sheikh Abbas. Later in the morning heavy enemy fire and infantry attacks develop from Ali Muntar and in the east from an enemy force advancing from Beersheba. By midday, the British realize the situation is hopeless and by last light their brigades have withdrawn south of Whadi Ghuzze. In the war at sea, the mercantile ship SS Thracia (Master R Nicholas) is on a voyage from Bilbao to Ardrossan with a cargo of iron ore when she is sunk by a torpedo fired from the German submarine UC69 twelve miles north of Belle Isle. Thirty-six men, including the Captain, are lost. 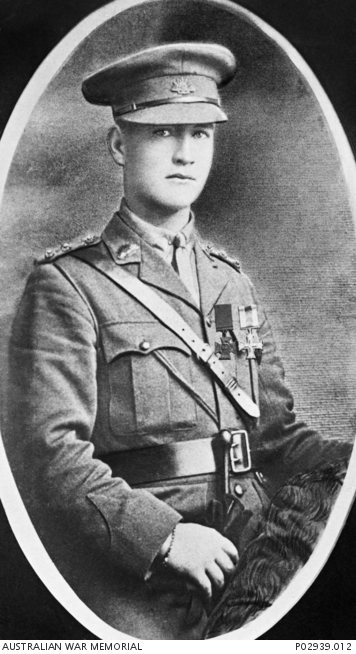 Captain Percy Herbert Cherry MC (Australian Infantry) is killed by a shell burst at age 21 one day after performing acts during an attack on the French village of Lagnicourt that will win him a posthumous Victoria Cross. After all the officers of his company had become casualties he carried on with care and determination, in the face of fierce opposition, and cleared the village of the enemy. The 7th Brigade is tasked with the capture of Lagnicourt. An artillery barrage opens up on the village at 05:15 on the 26th and continues for twenty minutes, allowing the infantry to close in. The plan is that Cherry’s company will storm the village itself while the battalion’s other companies encircle it. For the assault, Cherry splits his company into two sections; he commands one section himself and places the other under Lieutenant William Frederick Joseph Hamilton. The company is soon in action and Cherry’s section captures a large fortified farm on the edge of the village. As they enter the muddy main street, the Australians come under heavy fire from the houses lining the road and from an adjacent stable yard. Cherry rushes the stable yard and a fierce firefight develops, before the Germans surrender. As Cherry and his men move through Lagnicourt, they find the main resistance coming from a large chalky crater, “spotted with white chalk”, at the crossroads in the village center. The Germans’ defense holds up the advance and Cherry sends a messenger back for more Stokes mortars. Becoming impatient at the delay, Cherry decides to rush the position under the cover of Lewis Gun and rifle grenade fire. Capturing the crater, he finds Lieutenant Harold Hereward Bieske at the bottom wounded. Bieske had taken over command of the second section when Lieutenant Hamilton was wounded, and it has now been reduced to six men. After capturing the crater, Cherry pushes on through the village, where his party emerges from among the buildings on the far side. Another stiff fight ensures with a group of Germans in dug-outs by the side of the road, before the company is able to meet up with its fellow units which have bypassed the village and are already established to the north and east of the area. Cherry’s orders are to fall back into reserve, but he disregards them as he senses a counter-attack is forthcoming. At 09:00 today the Germans launch a very strong counter-attack under heavy artillery fire. At one point, Cherry notices that the Germans are firing yellow flares to pinpoint Australian positions to their gunners. He finds some of these flares, and fires them away from his position. The German attempts to retake Lagnicourt (at a cost to the 7th Brigade of 377 casualties) rage all day before they abandon the counterattack. Lieutenant John Savin Jones-Savin (Army Cyclist Corps attached Royal Welsh Fusiliers) dies of wounds received in action in Greece at age 27. He is the son of Canon Richard Jones-Savin. Second Lieutenant Edward Rodney Hasluck Grantham (Northumberland Fusiliers) killed in action at age 20. His older brother was killed twenty-seven days earlier. Second Lieutenant Harold Penrose (Royal Fusiliers) dies of wounds at age 23. His brother will be killed in April 1918. Company Sergeant Major David Francis Gillespie (Australian Infantry) dies of wounds at home at age 29. He is an Australian Rules Footballer. Lance Corporal Alexander Thomson (Argyll and Sutherland Highlanders) is killed at age 26. His brother was killed in July 1916. Private Alfred Hook (Royal West Kent Regiment) is killed at age 25. His brother will be killed in two weeks serving with the Canadian forces. Private Cecil Lockwood (Essex Regiment) is killed in Palestine. He is the middle of three brothers who will lose their lives in the War.